Ms. Candace Coates resides in Dutchess County, New York and has been playing the harp publicly since 1993. 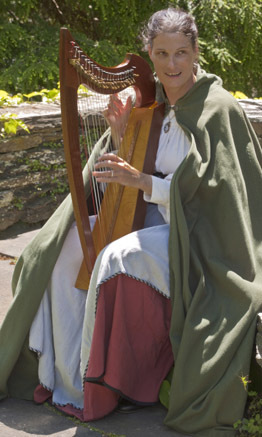 She performs an assortment of music in the Renaissance and Celtic formats. She has performed in a great variety of venues, ranging from Irish pubs, bookstores, small concert halls to outdoor performances at Renaissance Faires. Candace has found that performing in Renaissance garb from the Fourteenth century adds significantly to the impact of her educational performances. She has researched the clothing worn in Old World Europe and uses authentic reproductions of clothing from this time period. In the summer of 1994, she founded the Celtic and Renaissance ensemble, Druid Moon. The group, which numbered seven members, did public performances to educate listeners on the variety of Celtic and Renaissance music. Ms. Coates adopted the folk-education approach she learned from her ongoing involvement with Folkevirke Appleseed. Candace released an album of her work entitled "Selected Love Poems with Celtic Harp, Volume 1" in the summer of 1998. Before going out of print in 2003, the album reached 12 countries. In the summer of 2000, she directed and produced a cable television cable "A Parcel of Harps." This was a benefit concert for the Rhinebeck Center of the Performing Arts in Rhinebeck, NY. The music which was performed was a collection of traditional Celtic music. The quartet members came from Connecticut Massachusetts and New York State. The concert was taped live for later broadcast. In September of 2001, she toured with the show in Cape Cod, Massachusetts. In 2003, she recorded her second album, " Flights of Fancy." Copies are currently available in CD format by mail order. In 2005, Ms.Coates appeared in the book "Little Chapel On The River", written by Gwendolyn Bounds. 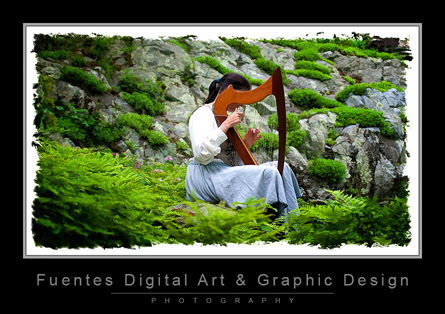 In 2010, Candace can often be seen playing her harp at Innisfree Gardens on Saturdays. The photographs on this page were taken by professional photographers who came to photograph the gardens and became enchanted by Candace's music.